Get your comfort food craving filled with this all-time family favourite meal. Get ready for your kitchen to be filled with the rich, mouthwatering aroma of simmering tomato sauce! 1. In a large bowl, combine turkey, breadcrumbs, 45 mL (3 tbsp) of the cheese, parsley and pepper. Using 15 mL (1 tbsp) measuring spoon, roll turkey mixture into meatballs and place on parchment paper lined baking sheet. Repeat with remaining mixture. Makes 24 meatballs. Bake in preheated 180°C (350 °F) oven for 10 minutes*. Remove from oven. 2. Meanwhile, in a saucepan, bring pureed tomatoes, carrot, onion, garlic, basil and hot pepper flakes to a simmer. Add meatballs; cover saucepan slightly and simmer for about 30 minutes or until thickened. 3. 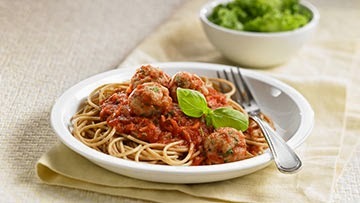 In a pot of boiling water, cook spaghetti for about 10 minutes or until tender but firm Drain well and return to pot. Toss with sauce and meatballs until well coated. Sprinkle with remaining cheese to serve. *Use a digital food thermometer to check that meatballs have reached an internal temperature of 74°C (165°F). To purée tomatoes, place in a blender or food processor and blend until smooth. If you do not have a blender you can substitute 800 mL (3 1/4 cups) strained tomatoes (passata). Ask older kids to help make the meatballs. Be sure they wash their hands with soap and warm water for at least 20 seconds before and after handling food. Time saver: Whip up a double batch and freeze extra for another day. Switch up the grated carrots with shredded zucchini for a change.